Rwanda is arguably the safest country in Africa, which is immediately apparent upon arrival in the relaxed and sophisticated capital Kigali. Though there’s a lot of security around, this doesn’t add tension; rather, the opposite. Safety: In 2017, Rwanda was listed as the ninth safest country in the world. Rwanda’s response to the genocide of 1994 was to pull the country together, rather than further dividing it. Today this has the effect of a solid safety record for tourists and Rwandans, with an emphasis on security. 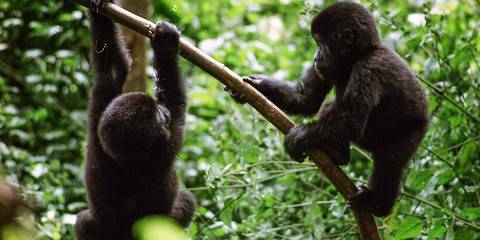 When to visit Rwanda: June to September is the dry season, though you can travel to tropical Rwanda at any time. It’s rare for tourists to experience crime in Botswana, largely due to the political stability of the country. Maun – the gateway to the Okavango Delta – experiences low levels of crime. Safaris are well-managed and highly experienced guides keep guests safe in potential wildlife encounters. Safety: Travelers will usually be heading to wilderness areas with very few people. There is little corruption and the tourism industry is well-established. When to visit the Okavango Delta: Wildlife viewing in the Okavango Delta and Chobe National Park is during the dry months of May to October. You can witness the zebra migration in the Makgadikgadi Pans during the green season of December to March. One of the safest places to visit in Africa, this island nation is perfect for relaxed holidays where security is of minimal concern. It’s a multicultural country where people live happily side by side. Families love Mauritius and the many beach resorts also help nervous tourists to feel safe. Safety: Port Louis is one of Africa’s top 10 wealthiest cities – less poverty traditionally means less crime. Throughout the island, a shared history (most people’s ancestors arrived here as slaves or indentured laborers) has helped Mauritians bond as a country, creating a safe and welcoming atmosphere. When to visit: May to November are the driest and coolest months. December to April is hot and humid, with most rain falling between January and March. A country of vast deserts, Namibia is popular for epic road trips, stargazing, wild safaris and adrenaline experiences from sky diving to quad biking around the adventure capital Swakopmund. The crime rate is low throughout Namibia, and few tourists experience any issues, which makes it ideal for those seeking safe places to travel in Africa. Safety: Namibia benefits from a sparse population and most tourists head to safer areas well outside the cities. Namibia is free of conflict and politically stable. When to visit Namibia: The weather is fairly consistent all year and there’s nowhere near as much rain as in other Southern African countries. 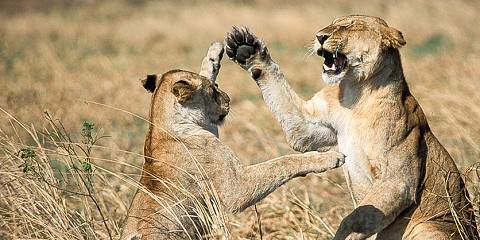 For Etosha wildlife viewing, visit in the dry winter season from July to October. An idyllic cluster of biodiverse islands in the Indian Ocean, the Seychelles has always been considered a very safe destination for travelers and one of the safest countries in Africa. There is little crime experienced by travelers, especially away from the main islands. Be wary of riptides when swimming in the sea. Safety: The government is stable, and tourism is an established industry. Most people stay in beach resorts, which vastly decreases the chance of encountering any petty or serious crime. When to visit Seychelles: April/May and October/November are best, outside the rainy seasons and when underwater visibility is best. For tourists, Ethiopia is one of the safest places to visit in Africa. Serious crime is rare and petty crime rates are low, especially outside the capital Addis Ababa. Although it was associated with famine for years, Ethiopia is now stable and has established much better levels of food security (though it is still one of the least developed countries in the world). Safety: Economic growth has been strong since 2007. The tourism industry has also grown in recent years, which has led to an easier experience for travelers. When to visit Ethiopia: The driest months of October to April are best, though the rains that fall from May to September do not particularly hinder travel. Morocco has a good safety record, with few tourists falling victim to serious crime. It has been unaffected by the turbulence seen in many other North African countries and has benefitted from a stable political system. Travelers may, however, experience petty crime such as pick-pocketing and scams in major cities such as Marrakesh, so vigilance is required. Safety: A stable government and lack of conflict within the country helps keep crime in Morocco to a low level. Tourism is also a major industry, so it’s in the citizens’ interests to keep tourists safe. When to visit Morocco: Morocco gets blazing hot over the summer, so visit in April/May or September/October for some relief from the heat. This little, mountainous country is land-locked within South Africa. Travelers in Lesotho usually spend most of their time in the rural areas where crime is unusual, making this a destination that will appeal to those specifically looking for safe places to travel in Africa. Safety: The relaxed and easy pace of life in Lesotho’s countryside make it a pleasant place to visit. Crime in these areas is rare. The cities are not as safe, so practise caution when travelling through. It’s best to hike in groups. When to visit Lesotho: March/April is cool but pleasant for hiking; June to August is best for skiing. Travelers in Zambia rarely experience any problems, often because they fly straight into wilderness areas. As with most cities, there is potential for theft in hubs such as Lusaka and Livingstone, but the vast majority of tourists are unaffected by this and Zambia is considered one of the safest places to visit in Africa. Safety: The political situation is relatively stable and there has been little conflict. On safari, an experienced guide will know how to maximize safety. When to visit Zambia: Wildlife viewing is best from May to October. Visit Victoria Falls from June to September when the water volume is lower, allowing better visibility. Though Kenya has been in the headlines over the years for political conflict or issues along the coast, the country is largely safe for the million-plus visitors it receives each year. The safari industry is the most established in Africa, and an excellent infrastructure enables travelers to easily get around the country. Even within cities such as Nairobi, crime is not an issue for the vast majority of tourists – though, of course, it pays to be cautious. There are travel warnings associated with the Somalian border area and the northern coast, though it’s easy to avoid these regions. Safety: Travelers will generally be on safari in wilderness areas where the only risks are associated with wild animals (and with a good guide, these risks are minimal). 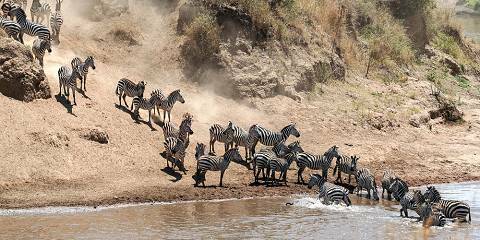 When to visit Kenya: Wildlife is best viewed July to October when it’s dry, which also coincides with the wildebeest migration arriving in the Masai Mara.